It's been a couple of years since I've successfully finished NaNoWriMo with a mostly completed novel, and it took me all the way through the rest of the 2000s to edit my work. There was also the subject of how to actually publish the novel - and after several unsuccessful attempts to interest an agent or publisher, I decided to self-publish. This is after all the age of the web, where we blow open the doors of encrusted organizations and Just Do It Ourselves, right? Right! 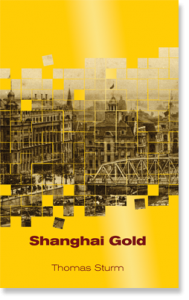 Well, it's been a busy couple of years, but now, finally, Shanghai Gold has been published! If you pick up a copy I'd be happy to hear how you liked it and please rate and review the book once you've read it at your favorite book seller's website.